With the advent of the occupational safety & Health act (OSHA) removal of toxic fumes and gases from the laboratory has become even more important. The Fume Hood is a primary safety device in a laboratory. It offers a substantial degree of protection to the user. It is a ventilated enclosure in which gases, vapours and fumes are contained. An exhaust fan situated on the top of the laboratory building pulls air and airborne contaminants in the hood through ductwork connected to the hood and exhausts them to the atmosphere. It further controls exposure of the hood user and lab occupants to hazardous or odorous chemicals and prevent their release into the laboratory. In Fume Exhaust Hood, room air draws across the hood face to capture and remove the contaminates. 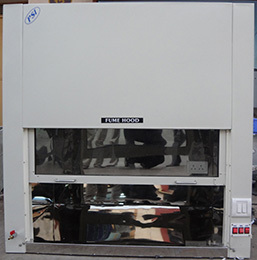 Hood is provided with inbuilt blower. Fume exhaust system comprises of an air capturing hood, duct, fan and exhaust outlet used for the removal of hazardous or noxious gases, vapors, mists, dusts and other aerosols from a work environment, store or apparatus. Research and development laboratory, Chemical Analysis lab, Quality control Laboratory.